How to use the infrared ink to print the mark on the playing cards? By our special printing machine and seasoned printing technician, we can use the UV and infrared invisible ink to print the marks on different kinds of poker playing deck. And those marks can be seen by infrared contact lenses or infrared sunglasses. We can provide UV ink in order to make your own designed marks. It can be written or printed on playing cards made of paper or plastic, on rummy or domino piece. It can be successfully used on cards of any colour. You must be aware that it is not easy to make the marks. The difference between the marks made by you personally and the marks made automatically by a marking printer is that the former will only last for 25--30 minutes while the latter will stay on for up to 2 years. Why does this difference exist? Because the printer will pouch microscopic holes on the back of the playing card and fill them in with ink. Thus the mark is performed in the fabric on the card and not on its surface. IR ink can be used on back of plastic playing cards as well as for pieces of domino or rummy. The main advantage is that you can make a long term customized mark. 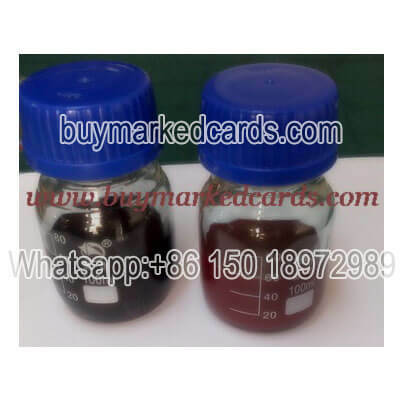 The package contains four bottles of ink that, if combined according to the schemes designed by our chemists, can make up to 30 decks of marked cards.